Low Calorie Recipe Book: Encouraging kids to eat healthy by playing healthy. Encouraging kids to eat healthy by playing healthy. Getting the kids on board with healthy eating. Getting the whole family to eat healthy can sometimes be a challenge. 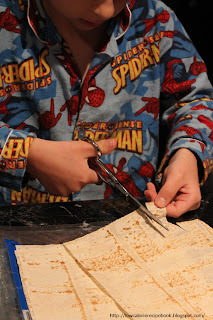 Kids can be quite agreeable if you get them involved with the cooking process and make it fun. My littlies love Nachos, so we make a healthy version from mountain bread. You can give the kids a pair of scissors and they can cut out their own shapes. They can make teddy bears or any shape that appeals to them. being more interactive encourages healthy eating. Pop the shapes into the oven on baking paper to crisp up. Then add a lean topping: Fried lean mince (can boil first to get fat out if you wish), tomato salsa (made form fresh tomatoes and herbs), avocado and a sprinkle of shaved parmesan. Cut out a few hearts for dad or mum and he/she will love it too! Get creative with your cooking and think of ways to make it an activity for the kids. Post any ideas you come up with. I would love more for my family too. Make some cheese rye snack from the mountain bread.